Photos; Protec helmets; VN "Terrifying high-speed chase"
Yes, I am still in the U.S. for a few more days. It feels strange being back here... and a bit uncomfortable. I'd really rather be at home in Đà Lạt. That said, I'm sure the novelty will wear off... and I'm very much looking forward to dark chocolate, crunchy American peanut butter, and chipotle hot sauce! If you're in the PNW and want to get together for a beer or a ride some time in the next couple weeks, drop me an email. even if you think you can balance the tank on your knee while you try to find the GPS wire... especially in the house! MUCH has happened since my recent post (click here) on my efforts to supply motorbike helmets to children in Đà Lạt. For those just joining us, Việt Nam is a "motorbike culture". By that, I mean that 50-125cc motorbikes are EVERYWHERE and account for over 98% of privately-owned motorized transportation. Those who can afford them (a five-year old motorbike in good condition sells for US$500 or less in HCMC) take them everywhere—starting with the first ride home from the maternity hospital. 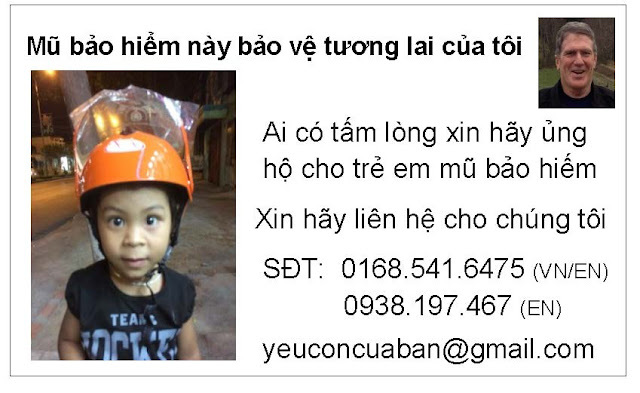 A 2015 Vietnamese law dictates that all persons six years old and up must wear a helmet while riding on a motorbike. Many/most do, though the helmets are generally of poor quality and apparently anything hard worn on the head qualifies—at least in the mind of the wearer. Children under six are NOT required to wear a helmet, so my self-appointed mission is to provide motorbike helmets for as many of them as I can. I am also providing helmets for older children when the opportunity presents. For more details, please see my previous posts "Mũ bảo hiểm này bảo vệ tương lai của tôi" (the post is in English) and "A Successful Sale". 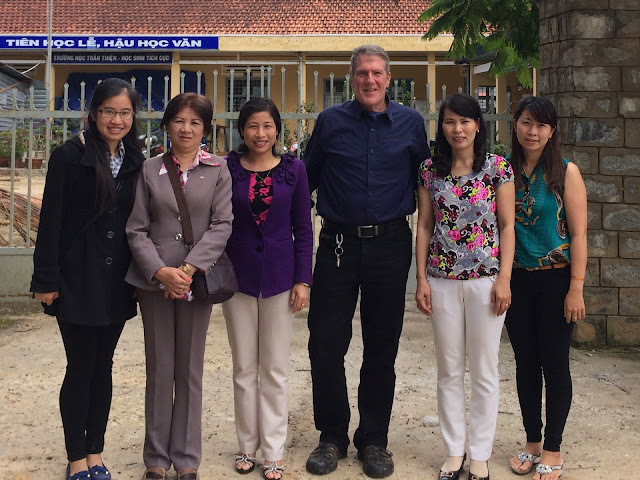 We visited a second school suggested by Tuyết, the head of the Đà Lạt chapter of the Red Cross. I met her because she is a friend of My, one of the two young women who are helping me with this effort. 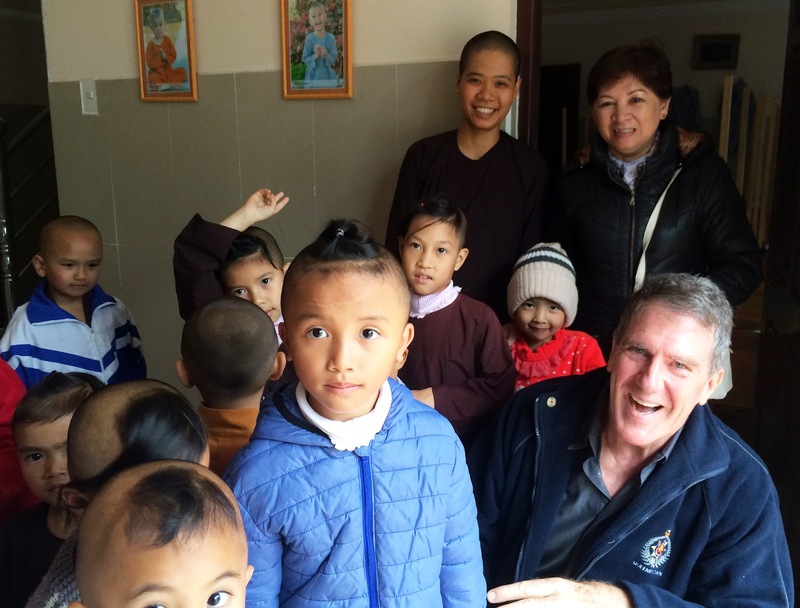 I previously visited a Buddhist temple and orphanage with Tuyết and saw some of the work she's doing. The two fingers in a "V" has a triple meaning. It means "Hi" (Hai is how you say 2 in Vietnamese), "Vietnam", and "Peace". Tuyết is standing on the right in the first photo. 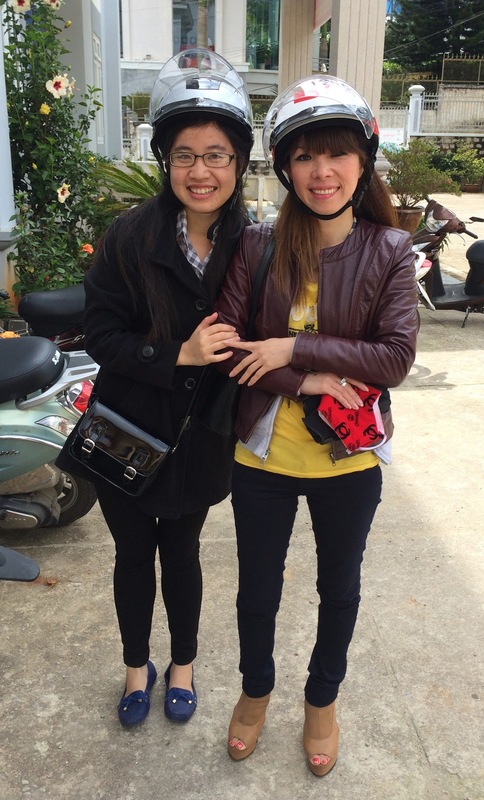 When My told her of our helmet project, she asked if she we would consider choosing a very poor school where less than 20% of the parents, most of whom make less than 100,000 VND (~US$4.60) a day, can afford to buy their child a 150,000 VND helmet. ABSOLUTELY! We were picking schools pretty much at random and expert guidance is always welcome—especially one who told me to give my offered donation to the orphanage directly to the monks and not to her to then distribute. The school principal (third from left below) was very welcoming of our offer of helmets for each of her 150 students. Once again we will also give helmets to the staff so that EVERYONE at the school wears the same helmet. During our conversation we again broached the subject of "how do we keep the parents from selling/trading the gift helmet for food?" 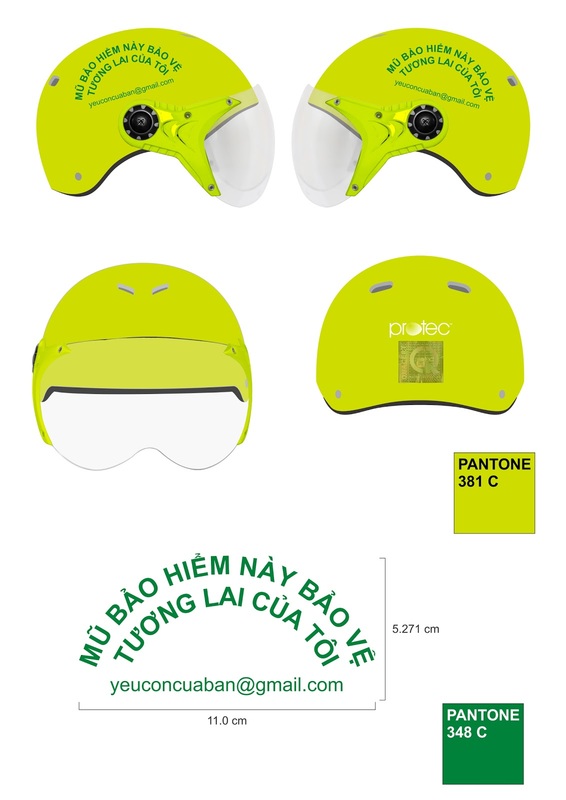 The principal responded immediately by saying (this back-and-forth was only possible with Vy's excellent translating skills) that wearing the helmets would be required of all children and that those who do not wear them will get a demerit. Please remember that Việt Nam is a Communist-run country and that very few people want to stand out for notice by authorities, so demerits are much more unwelcome than in the west. The two sides say something slightly different due to culture differences. 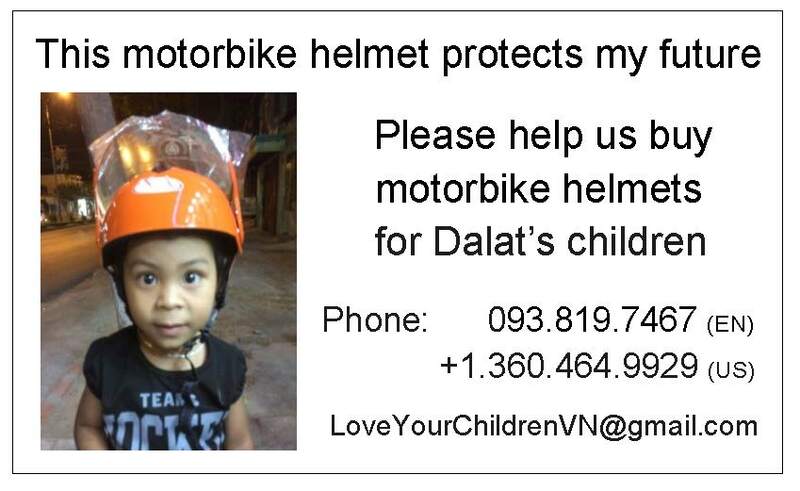 My was very helpful to me in determining the best wording to put on the Vietnamese side, "Who has the heart to please support protection helmets for kids, please contact us". It was an interesting discussion because although her English (and probably her Swahili) is better than my Vietnamese, our in-depth conversations mostly involve each of us typing into Google Translate on our respective phones. She also insisted that my photo go on the VN side. I pushed back on that one because I want this to be about the helmets, NOT me. Her reasoning was that Vietnamese people would be very leery of our efforts unless they knew that a westerner is involved. Thinking back to the reaction Vy reported from some of her initial school contacts when they pretty much told her that she was running some kind of scam, I had to agree. I did make it as small as she would let me, though. My contact at Protec, Nguyen Hoang Anh, is very patient and accommodating. She even got her boss to authorize a discount of 18% over the standard 15% for this quantity. That's a 20% larger discount (18/15=120 for the math-challenged) and allowed us to buy 16 more helmets. Thank you, Protec! Next Friday I will pick up two samples—one small and one medium—in Ho Chi Minh and pay a 60% deposit. Then, in early September, they will ship about 60% of the helmets to my house in Đà Lạt—a few more than we need for the first school. Once we receive those helmets, I will pay the 40% balance and they will deliver the rest of the helmets within three days. Normally, they take a 50% deposit and the balance is due within five days of delivery of the complete order. Since I am a private individual, not a company; a foreigner who can leave the country at any time; have no history with Protec; and have no credit rating here; the accountants were understandably reluctant to ship without guarantee of final payment. Their first proposal was that I pay a 50% deposit upon receipt of the samples and then the balance one day prior to delivery. I counter-proposed and they accepted. It was a very quick and painless negotiation. Saturday afternoon was the monthly ex-pat gathering at Zen Café and I had a chance to talk with a couple people about the helmet project. I also handed out some of the new cards. The ex-pats with whom I spoke were a bit skeptical that the kids would wear the helmets and/or that the parents wouldn't sell them. That gave me the opportunity to explain the process as well as the comments and promises from the two school administrations. My guess is that they're still a bit skeptical (living here does that to many westerners, including me), though I think they're considering helping out with the next round of helmets. When I met Rick, who's lived here 10 years and is married to a VN woman, we started talking about our thoughts of VN. I mentioned that on my first trip here I was taken back by the lack of helmets on children and that I was glad to see that the new law is apparently working. He replied that he wanted to spend up to US$1000 to buy helmets for children, but had no idea where to get good helmets or how to distribute them. If you're reading this in an email, click here to go to the web site and view the video. More on the new place as soon as I can get off the damn Internet and finish the move.